Throughout my life, I have read and enjoyed many books. Some of them have made a big impact upon me. But in recent years, the book that perhaps has had the biggest impact on my life was one that I didn’t finish reading. In mid-late 2008 during one of my visits to the psychiatrist, I asked if there were any books that he recommended reading. 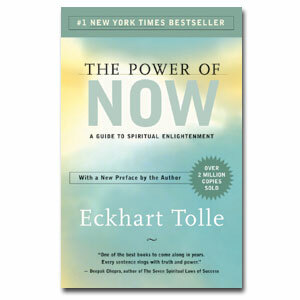 He suggested a book and author whom I had never heard of before – The Power Of Now by Eckhart Tolle. Shortly after that session, I bought myself a copy. That night at home, after a visit to Wikipedia, I learned more about Tolle and the astounding success of his work. During the following week, I tried reading The Power Of Now. At first, I found it very intriguing – especially when Tolle described how after he had made his discovery, he pretty much spent the following two years sitting on a park bench and just simply ‘enjoying the moment’. Unfortunately, I soon found Tolle’s content and style rather dry and dull, and a week later I had decided not to continue reading The Power Of Now. What I had read, though, stayed with me. As I described in my previous post, two of my biggest problems in life has been dwelling too much on the past and dreading too much about the future. What The Power Of Now stressed, though, was focusing on the present, because ‘now’ is the most important moment of your life. So, I began to adopt that approach, and one of the first places I did so was in my psychiatrist’s office. During sessions, if I had run out of things to talk about, I would just sit quietly, stop worrying about not having anything to talk about, think about nothing, and live in the moment. It was very relaxing, and inspiring. Soon, I was applying the Power of Now in the outside world – especially if I found myself in a situation where I had to wait because of a delay. For example, instead of getting angry and frustrated if a train was late, I would mentally tell myself to relax because there was nothing I could do to change the situation, and therefore I should just enjoy not having to do or worry about anything ‘now’. It worked, and to this day it continues to work. I was especially struck by the Power of Now in early 2009, when I spent two months visiting Canberra each week for work. Some weeks, the only hotels that were available were across the city and I had to rely on taxis for travel. Although getting to work was no problem, as hotels could call taxis immediately, getting home could be another issue – and on some afternoons, I found myself waiting up for an hour for the next available taxi (calling a cab was possible, but somewhat hit-and-miss). At first, I would read a book while waiting, but this was distracting as I also had to keep an eye out for any approaching taxis. So, I stopped reading and would just sit or stand…and wait. And again, living in the moment worked. I reasoned with myself that, okay, it may be forever before a taxi arrives – but until then, I can’t do anything about it, so just be calm and enjoy not having to do anything ‘now’. And I did, and so waiting for a taxi at the end of a working day in Canberra became a pleasant-enough experience (not something I would do for fun, of course – but if it has to be done, it no longer has to be a chore and a drag). Ever since I never finished reading The Power Of Now, I have often thought about giving it another try to see if there is anything else I have missed. If I don’t, though, what I have gotten from that book has benefited me immensely. Last night, though, I did finish a book that was very thought-provoking if highly critical of a major school of thought in self-help. Although hard to put down because it was highly compelling, it also troubled me a little – until I got to the postscript. This entry was posted in Life Strategies, Resources. Bookmark the permalink. At long last, you can read about the other book here.